One look at this modern hostess' silhouette and you can just about guess the kind of thing she keeps in that refrigerator. You'd know it must be stocked with the lighter, less filling foods that make up the diet of the world's most attractive people today. That's how they keep those slender waistlines. How they stay so younger-looking year after year. Why they feel so good, so fit for all the activities, all the fun modern living has to offer. And it is to suit their modern taste that today's Pepsi-Cola is reduced in calories. Never heavy, never too sweet, it refreshes without filling. Have a Pepsi, the modern, the light refreshment. This ad creates a weird "us and them" vibe. 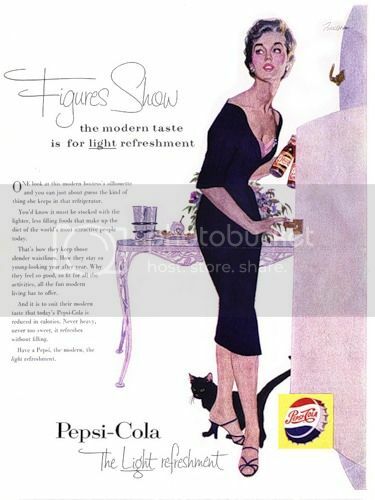 Like we're looking into a world of young, thin, "modern", glamorous people who have cats and consider Pepsi food. Why do you think I got all these damn cats?! And a fridge stocked with nothing but R.C. Cola?! I'm TRYING to be young, thin, modern and glamorous! Oh, wait. It's Pepsi, you say? This one's almost as bad as the one about the electric girdle or whatever it was. Ha! Well, maybe R.C. works, too. And it will save you money in the process. Although, I don't know if today's R.C. is reduced in calories to make it lighter and less filling. I'm so excited to see that it's reduced in calories! If it's 180 or whatever now, what did it used to be? Tracey, come on. We all know you have cats and consider Pepsi food. Admit it! What I want to know is why those things don't make me slim and glamorous. Working at a food station is not a shame as it is a social service. Food is very essential for all human being. Choosing the right food for us is a difficult tax. In such cases the workers help us because they have the sufficient knowledge about this.